Advection Fog during thaws, when very cold surfaces are overrun by air with dewpoints above freezing, can be very dense, and very difficult to detect via satellite; typically advection fog accompanies extratropical cyclones and their accompanying multiple cloud layers. The toggle above compares the ‘Night Fog’ Brightness Temperature Difference field (10.3 μm – 3.9 μm), historically used to detect low stratus because of radiation emissivity differences of clouds made up of water droplets at those two wavelengths, and GOES-R IFR Probability which fuses information from the satellite — not particularly useful in this case as far as low-level visibility is concerned — with information about low-level saturation from the Rapid Refresh Model. 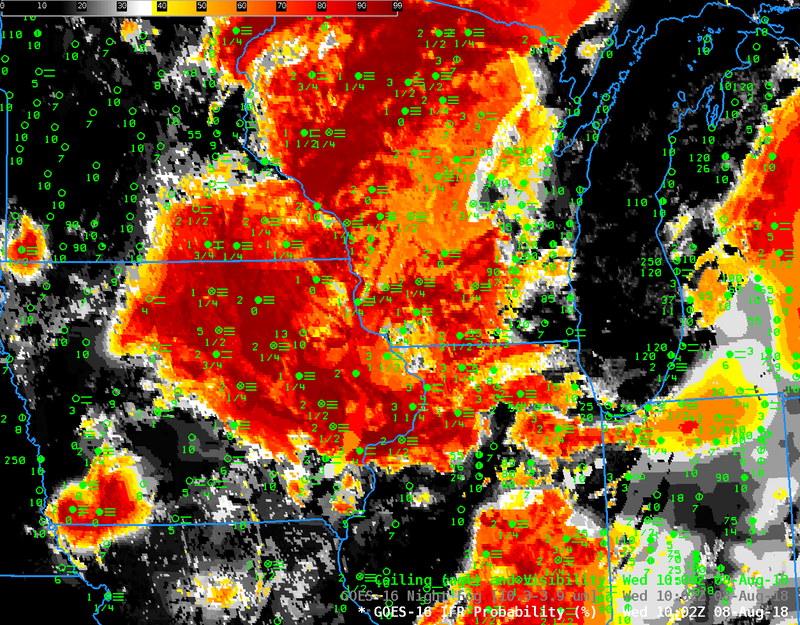 GOES-R IFR Probability gives a much more accurate depiction of exactly where the reduced visibilities and lowered ceilings are present, a vital piece of information for aviation (for example). 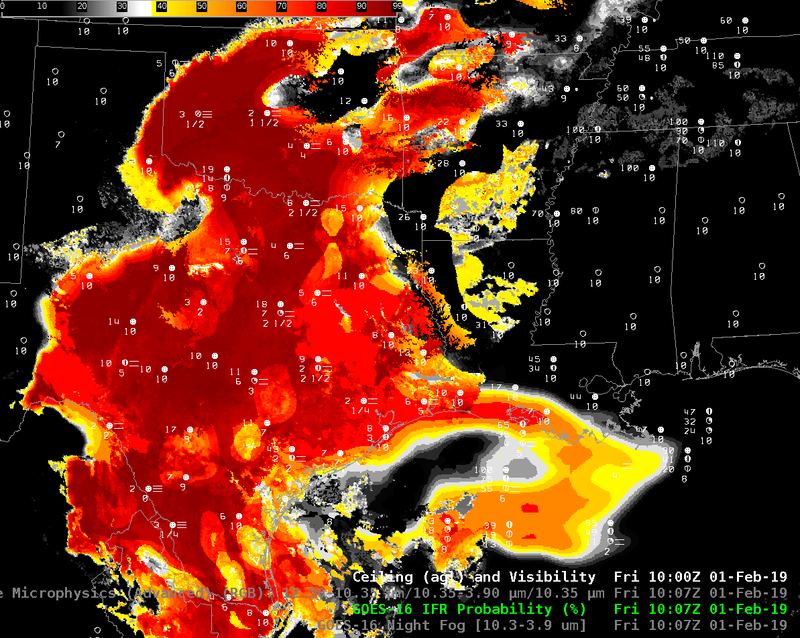 In addition, Low IFR Probability suggests where the lowest ceilings and greatest visibility reductions occur. The toggle below compares IFR Probability and Low IFR Probability at 1202 UTC (Here’s the toggle at 1642 UTC). As expected, the region of Highest Low IFR Probability is contained within the region of highest IFR probability; values of Low IFR Probability are somewhat smaller than those for IFR Probability (the same colorscale is used for both products). This entry was posted in GOES-16, Midwest on February 4, 2019 by Scott Lindstrom. The toggle above displays the Night Fog Brightness Temperature Difference field (10.3 µm – 3.9 µm) and the Night Time Microphysics Red/Green/Blue (RGB) Product that uses the Night Fog Brightness Temprature Difference field as its green value. In the color enhancements above, cyan in the Night Fog Brightness Temperature Difference denotes positive values that occur because stratus clouds — that is, clouds that are made up of water droplets — do not emit 3.9 µm radiation as a blackbody. Consequently, the computation of brightness temperature (which assumes blackbody emission) results in a 3.9 µm brightness temperature that is cooler than at 10.3 µm (clouds are emitting 10.3 µm radiation very nearly like a blackbody). Low clouds in the RGB that may or may not support IFR conditions range in color from light cyan (over Texas and Florida) to more orange and yellow (yellow over the Great Lakes were exceptionally cold air is in place). The fields above are overpredicting where fog/low ceilings might be occurring because cloud top measurements from the Brightness Temperature Difference do not always give reliable guidance on cloud base. By merging satellite information about clouds and cloud type with Rapid Refresh model information at about low-level saturation, GOES-R IFR Probability fields screen out regions where IFR conditions are unlikely; the map suggests low ceilings and fog are most likely over Texas and Oklahoma. 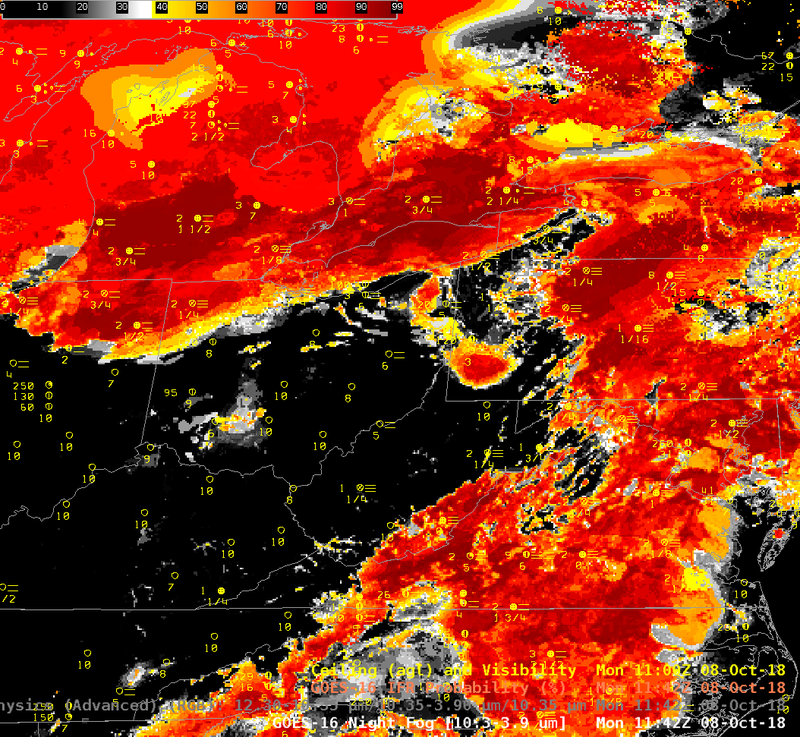 The zoomed in image, below shows that IFR conditions are indeed occurring in this region. Other regions with a strong signal in the Brightness Temperature Difference field — Tennessee, for example — show low IFR Probability and surface observations that do not show IFR conditions. The same relationships occur at 1007 UTC; the Night Fog Brightness Temperature Difference and Nighttime Microphysics RGB overpredict the regions of low clouds/fog; IFR Probability’s use of Rapid Refresh Data allows it to screen out regions where fog is not present, but stratus clouds are, and also add in regions where cirrus clouds prevent the detection of low clouds, but Rapid Refresh data suggests low-level saturation is present (such as over the Gulf of Mexico south of Louisiana). 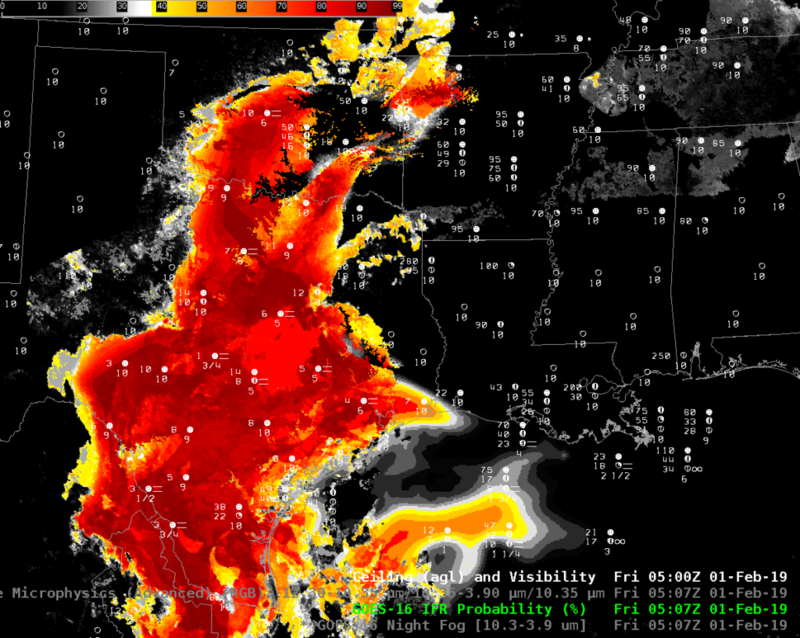 The IFR Probability field is accurately outlining the region of IFR conditions. This entry was posted in Midwest, Plains, Texas on February 1, 2019 by Scott Lindstrom. 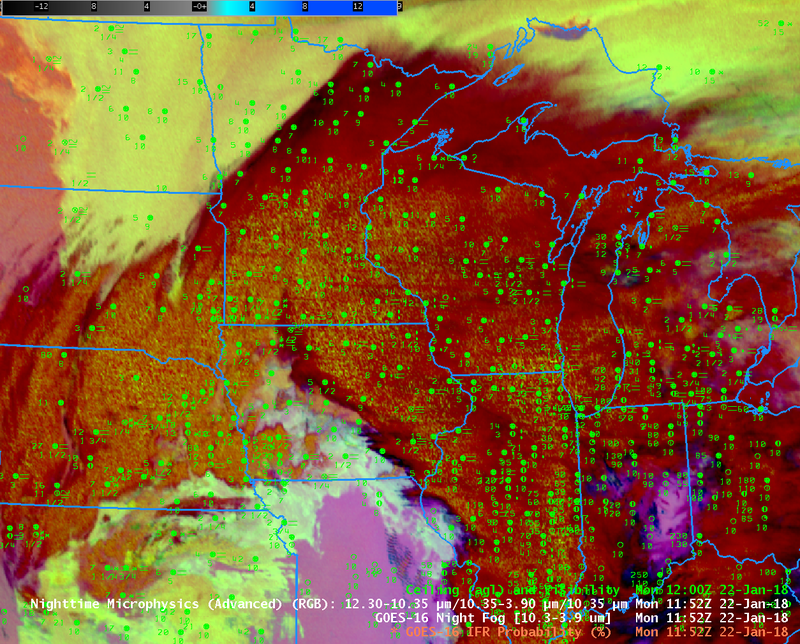 Fog over the Dakotas and Minnesota: Where is it? 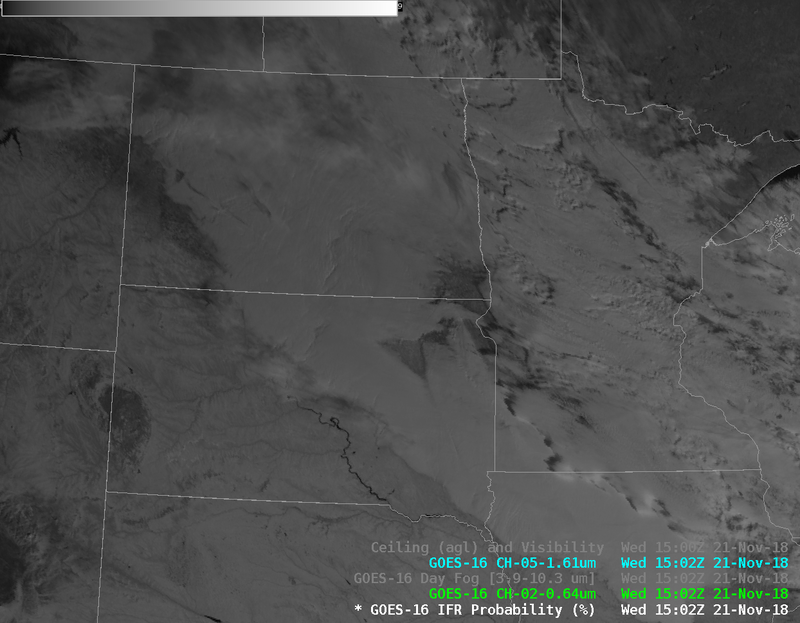 Consider the GOES-16 Visible (Band 2, 0.64 µm) Image above. Where is the fog in this image? Certainly you can tell where clouds exist, and if animated, you could identify snow on the ground (because it wouldn’t move like clouds do). 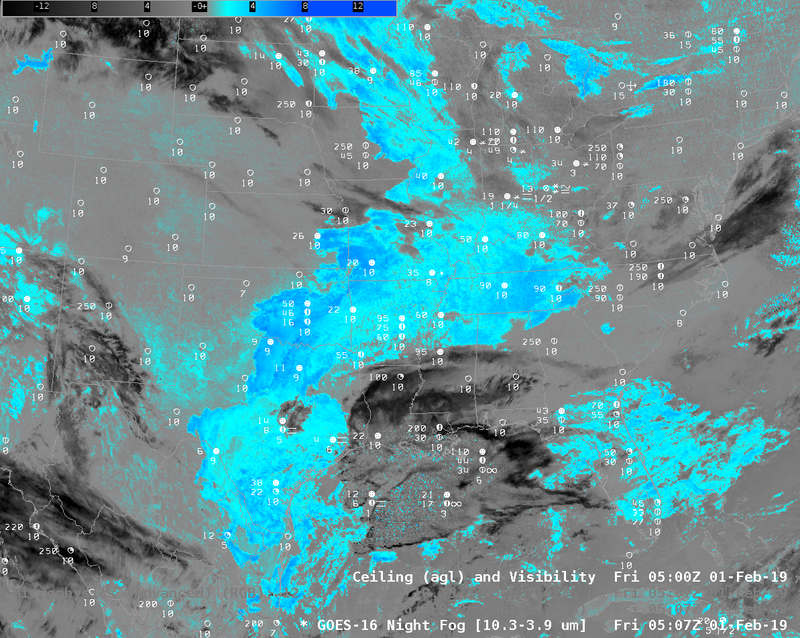 Alternatively, you could toggle between the visible and the Snow/Ice band (Band 5, 1.61 µm), below; regions of snow/ice — such as in western North Dakota, or northeastern South Dakota, or Ontario appear bright in the 0.64 µm but dark in the 1.61 µm. 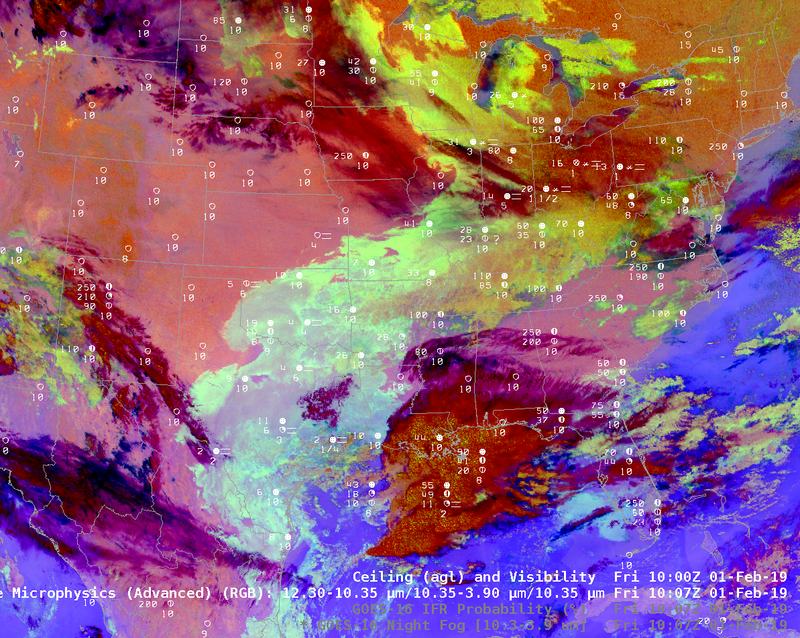 The Day Fog Brightness Temperature Difference product (3.9 µm – 10.3 µm) highlights low clouds. Stratus clouds with water droplets are scatterers of incoming solar radiation. The clouds over Minnesota and Iowa appear to be composed of much smaller water droplets, however, because they are so much warmer — the brightness temperature difference is much larger. Smaller droplets are better scatterers of incoming solar radiation. The image below shows the field, also at 1502 UTC on 21 November. Are there any differences in this field that suggests fog might be present in one location, but not in the other? The Day Snow Fog RGB composite, below, highlights regions of low clouds, snow/ice, and higher clouds. Snow (and clouds made of ice) are shaded red, low clouds are shades of grey/blue. Where is the fog? GOES-R IFR Probability Fields are a better predictor of where IFR conditions (that is, reduced visibility and lowered ceilings as might occur with fog) are occurring. 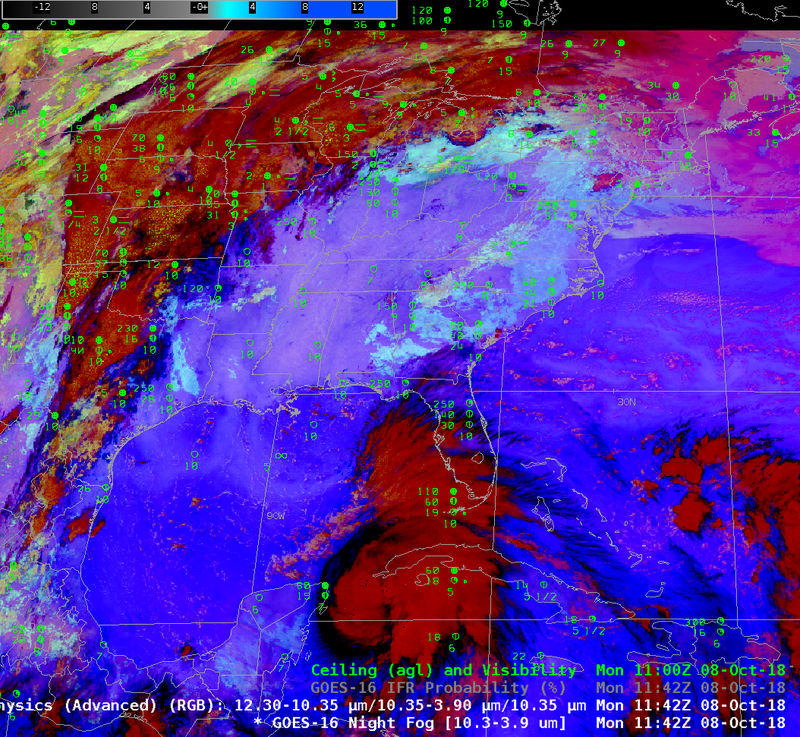 It combines satellite information and low-level informatio0n about saturation (from the Rapid Refresh model). This fusing of data accentuates a satellite strength (detection of low clouds made up of water droplets — that is, stratus) and the model strength (namely, where are the low-level saturated?) 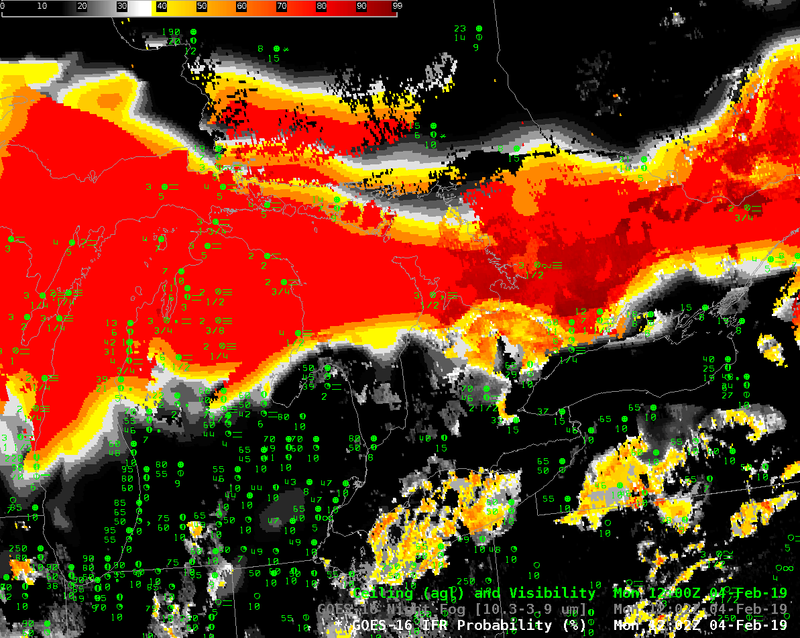 In the image below, fog and high probabilities of IFR conditions neatly overlap. This toggle is between the visible, Day Snow-Fog RGB and IFR Probability field. 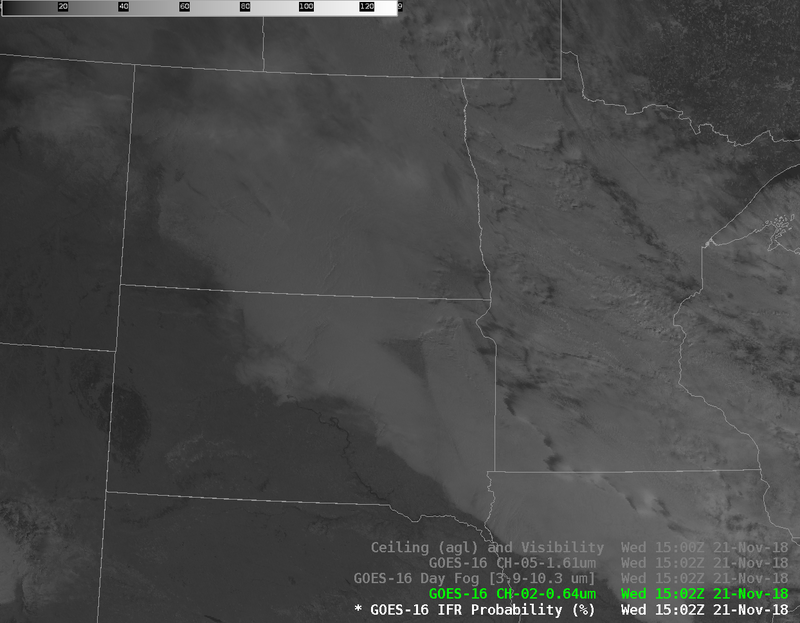 This entry was posted in GOES-16, Midwest, Northern Plains on November 21, 2018 by Scott Lindstrom. 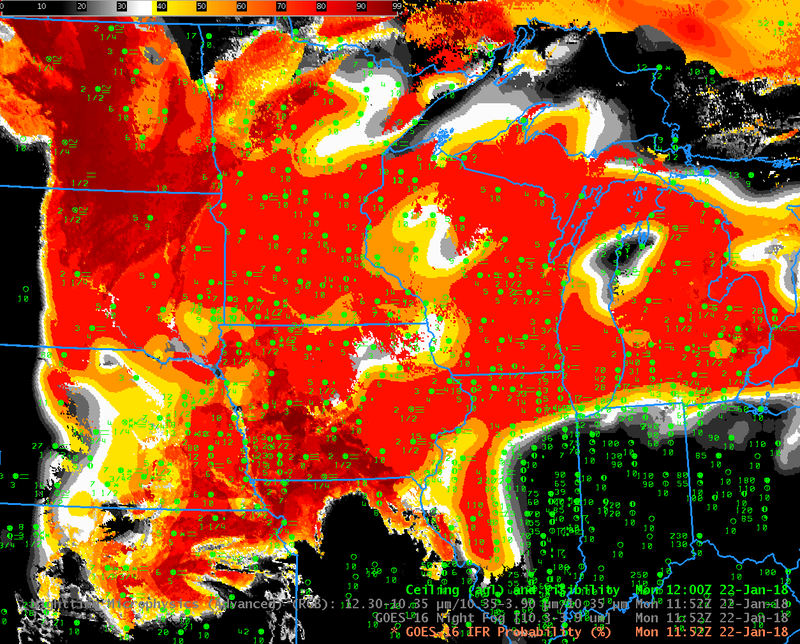 Fog and low stratus were widespread on 8 October over the Plains, in particular over Iowa and Minnesota. What satellite tools exist to highlight such regions of lowered ceilings and reduced visibility? When IFR conditions — fog and low stratus — occur with extratropical cyclones that generate multiple cloud layers, satellite detection of low clouds is difficult because higher clouds get in the way of the near-surface view. 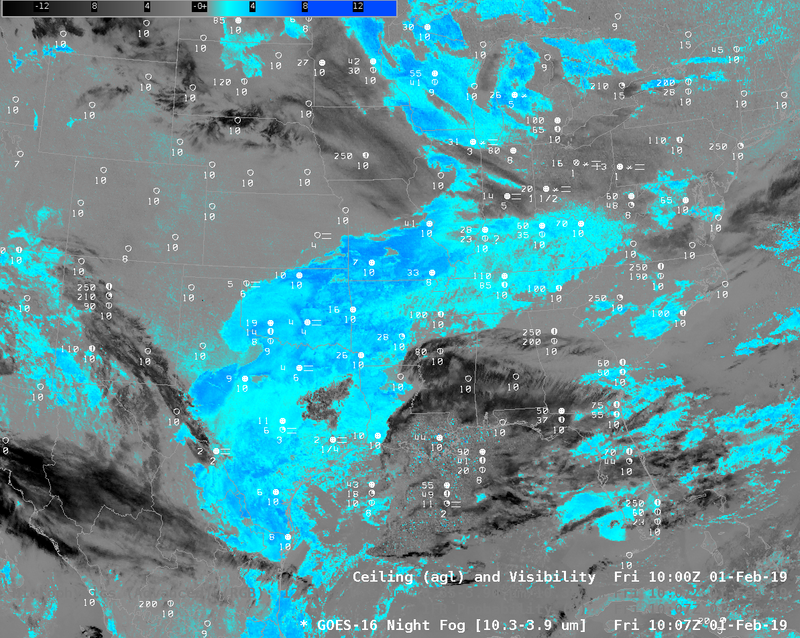 The animation above steps through the Night Fog Brightness Temperature Difference (10.3 µm – 3.9 µm; low clouds in the default enhancement are cyan), the Nighttime Microphysics Red-Green_blue (RGB) composite (low clouds in the RGB are cyan to yellow, depending on the temperature) and the GOES-R IFR Probability field (Probabilities for IFR conditions are highest in orange/red regions) for 1142 UTC on 8 October 2018, when low ceilings were widespread over the Plains and East Coast. Abundant high clouds rendered the Night Fog Brightness Temperature difference product (and, by extenstion, the Night Time Microphysics RGB, because the RGB uses the Night Fog Brightness Temperature Difference as its ‘Green’ Component) ineffective in outlining potential regions of low clouds. In contrast, the IFR Probability field was able to highlight low clouds under the high clouds because it fuses satellite data (ineffective at this time) with Rapid Refresh model estimates of low-level saturation. 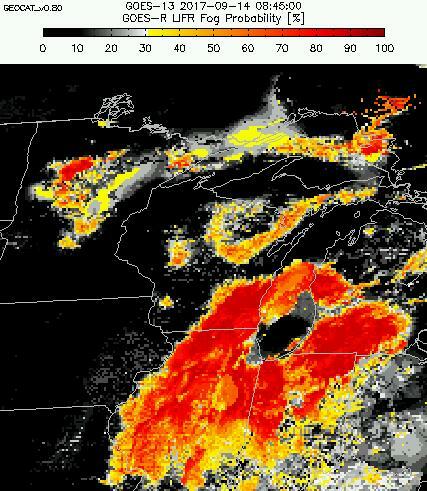 There are regions — southern Lake Erie, for example — where the lack of high clouds allows the Brightness Temperature Difference field, and the Nighttime Microphysics RGB to operate with success in identifying low clouds. The toggle below shows the Night Fog Brightness Temperature Difference and the IFR Probabiity fields over the eastern portion of the country. Very small-scale (in the horizontal) features, such as river fog, are a challenge for IFR probability because the Rapid Refresh horizontal resolution of 13 km may not resolve river valleys. This entry was posted in GOES-16, Mid-Atlantic, Midwest, Multiple Cloud Layers on October 8, 2018 by Scott Lindstrom. The longer August nights over the upper Midwest (for example, Madison Wisconsin’s night is about 70 minutes longer now than it was at the Summer Solstice) can allow for dense fog to form when light winds and clear skies follow a cloudy, damp day. The animation above shows the evolution of the GOES-R IFR Probability fields as the dense fog develops, a fog for which advisories were issued. 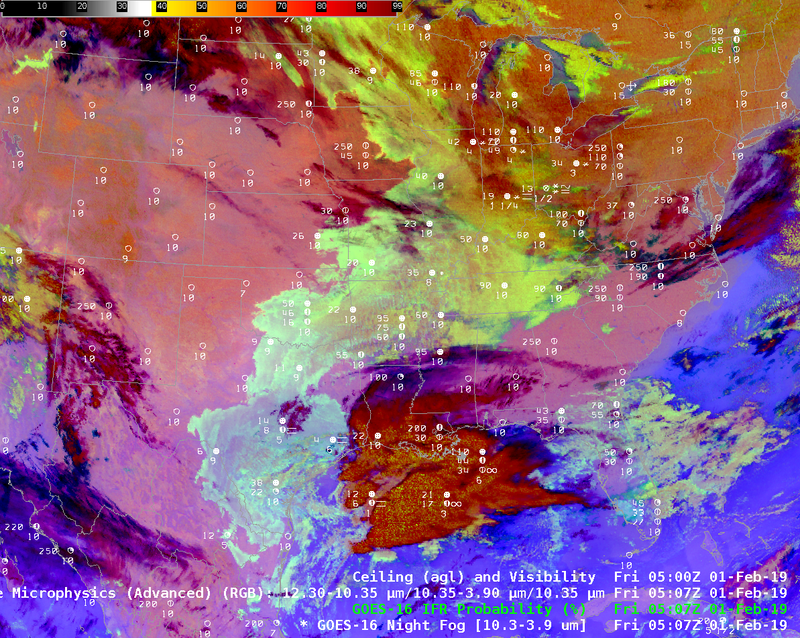 The horizontal extent of the widespread fog is captured well in the IFR Probability fields. There are a couple of things worth noting. There is a subtle — but noticeable — change in the IFR Probability Fields each hour in the animation. That change is related to model data in this fused product. 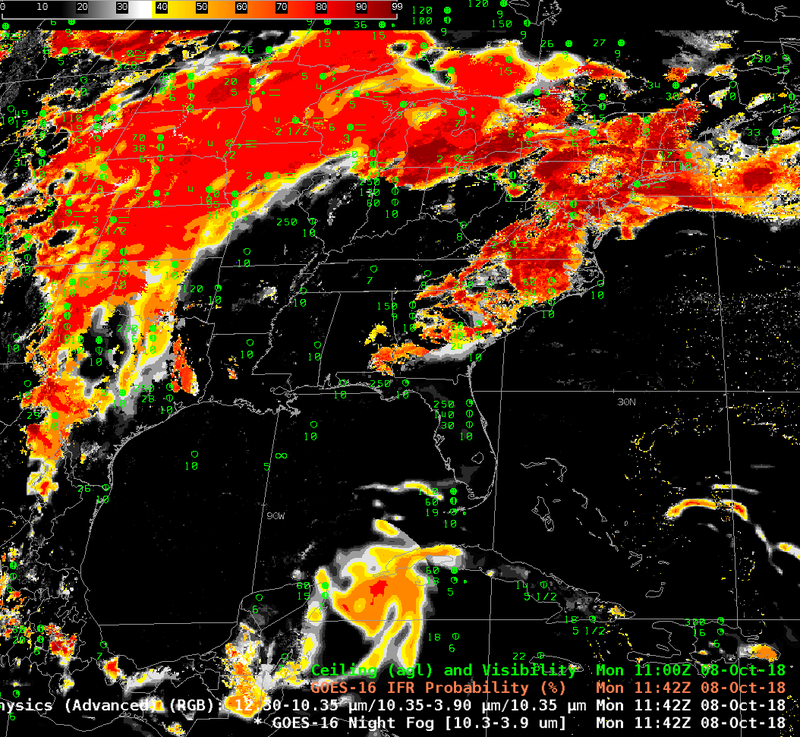 Rapid Refresh Model output are used to identify regions of low-level saturation that must occur with fog. (The inclusion of this data helps IFR Probability better distinguish — compared to satellite imagery alone — between elevated stratus and fog). When output from newer model runs is incorporated (and that happens every hour), the IFR probability fields are affected. The amount of change is testimony to whether the sequential runs of the Rapid Refresh are consistent in capturing the developing fog. In this case, there were differences from one model run to the next. Two boundaries are apparent in the animation above, captured in the 1202 UTC image above, and in the 1302 UTC image below. These boundaries are related to the Terminator, the dividing line between night and day. During an hour around sunrise, rapid changes in reflected 3.9 µm solar radiation make the detection of low clouds difficult. Temporal adjustments are incorporated into the IFR Probability fields to create a cleaner field. In the 1202 UTC image, above, the effects of sunrise are occurring along the NNW-SSE oriented boundary near the Mississippi River in southwestern WI (The boundary is parallel to the Terminator line, so it will be vertical — parallel to a Longitudinal Line — on the Equinoxes). 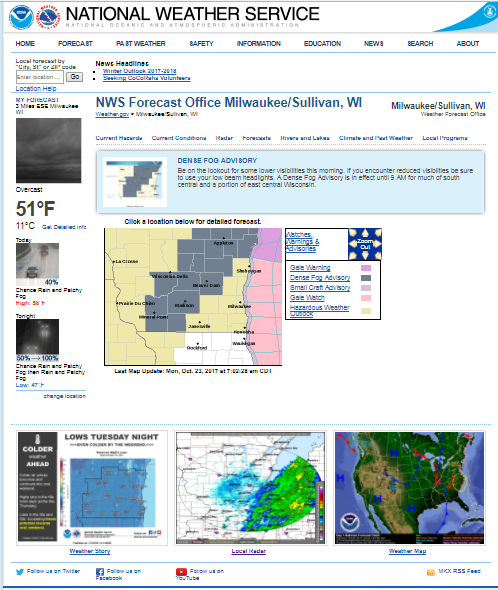 In the 1302 UTC image, below, the second boundary is over far northwestern Wisconsin, far southeastern Minnesota, and eastern Iowa. The region between these two westward-propagating boundaries is where information from previous times is used in the IFR Probability fields. Thus, when the second boundary passes, you may observe rapid changes in IFR Probability fields. The Night Fog Brightness Temperature Difference (10.3 µm – 3.9 µm) can be used to detect stratus, and that field is also a constituent (the ‘green’ part) of the Advanced Nighttime Microphysics RGB. The animation below compares these two products used to detect stratus with IFR Probability at 1002 UTC on 8 August 2018. 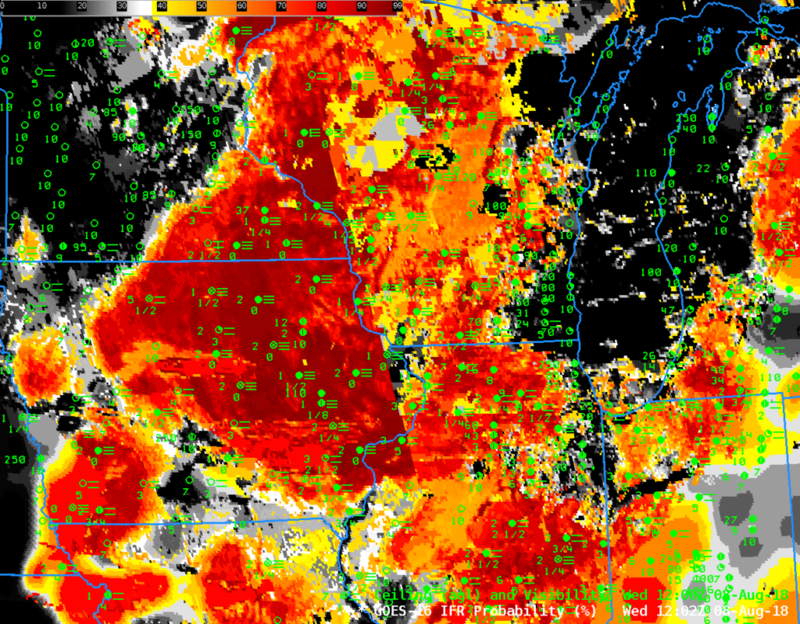 The Night Fog Brightness Temperature Difference fails to highlight regions of fog over central WI (and elsewhere), so neither it nor the RGB give a consistent signal over the entire fog-shrouded region. This entry was posted in GOES-16, Midwest, Wisconsin on August 8, 2018 by Scott Lindstrom. 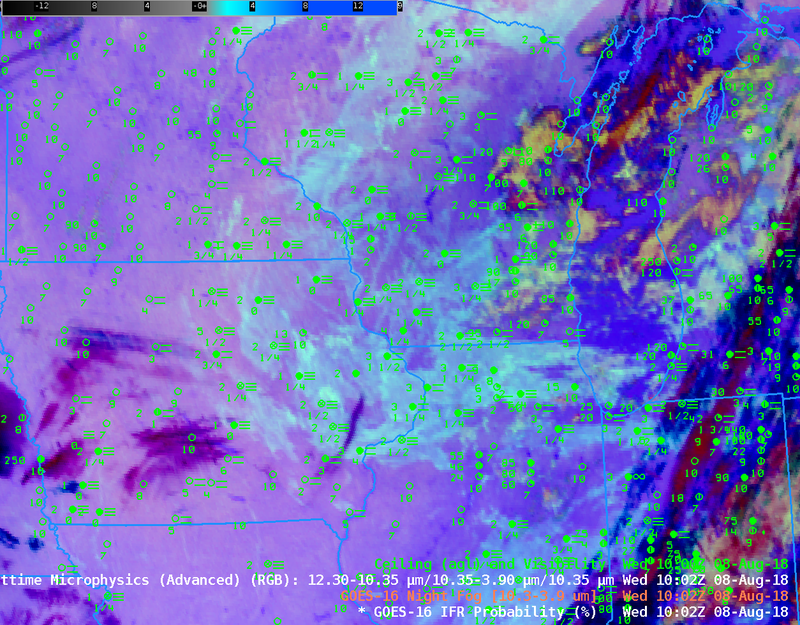 Advection fog in the Spring, when high dewpoints overrun very cold ground surfaces, usually in association with an extratropical cyclone, are very difficult to detect using satellite-only products, as shown in the Brightness Temperature Difference field animation below (Click here for the same animation but with a 5-minute time step as observed in the CONUS domain by GOES-16). 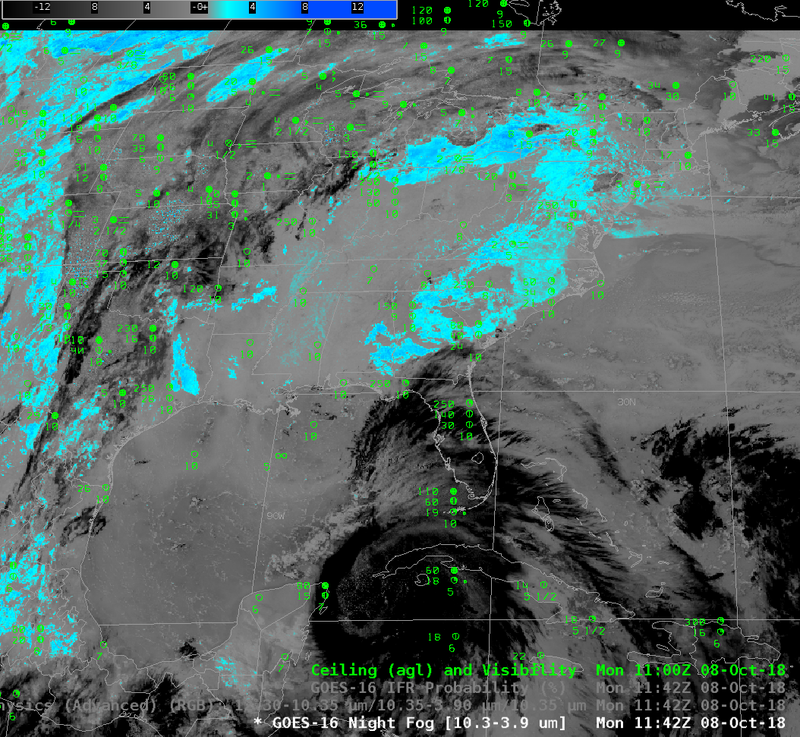 GOES-16 IFR Probability, above (Click here for an animation with a 5-minute cadence), is able to highlight the region of low ceilings and visibilities because Rapid Refresh Data supplies information about near-surface saturation that is lacking in satellite-only products such as the Brightness Temperature Difference, below, or, say, the Nighttime Microphysics RGB that uses the Brightness Temperature Difference. A toggle including IFR Probability, Night Fog Brightness Temperature Difference, and Nighttime Microphysics is below (from 0902 UTC on 29 March). Only the IFR Probability has an obvious signal difference between regions with IFR Conditions and regions without. This entry was posted in Midwest, Multiple Cloud Layers on March 29, 2018 by Scott Lindstrom. 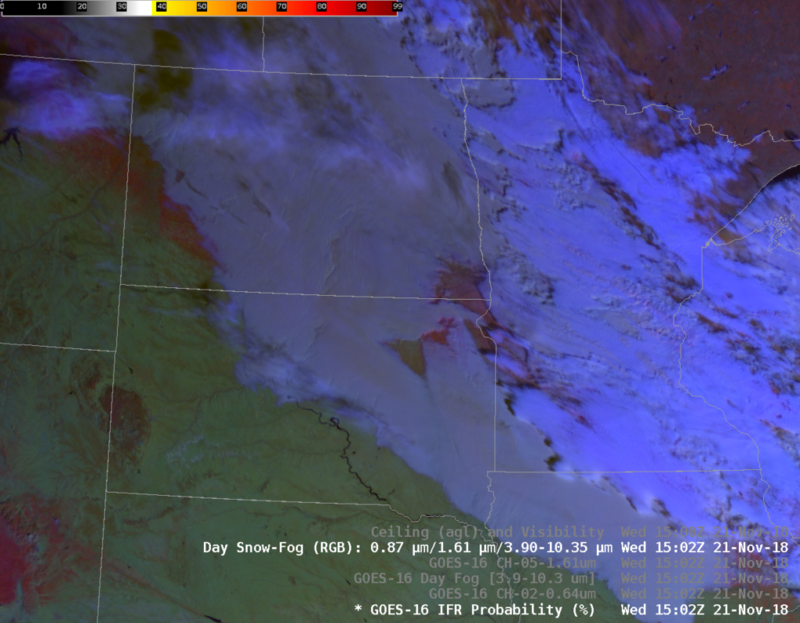 When skies are clear, and radiation fog forms, limiting visibilities, it’s straightforward to use satellite-only products to gauge where stratus and fog might exist. Extratropical storms generate multiple cloud layers, however; when warm sector air under multiple cloud layers overruns snow-covered or frozen ground, dense advection fog can develop, and that fog is difficult to discern from satellite because it is typically overlain by higher clouds. GOES-R IFR Probabilities, above, (and Low IFR Probabilities here) show highest probabilities in general occur in the regions where IFR conditions were observed on 22 January. 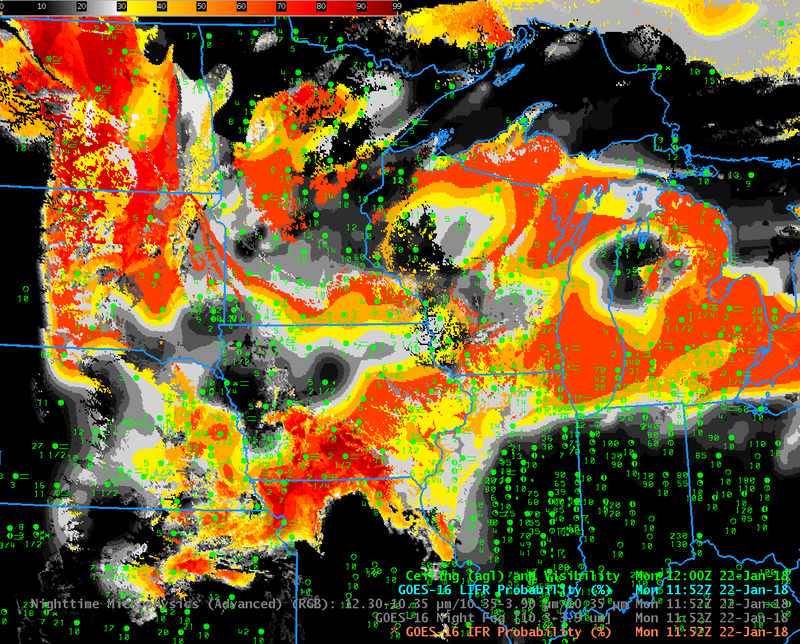 Over much of Wisconsin and Minnesota, the IFR Probability field is mostly uniform. Such a flat field is characteristic of a region where satellite data cannot be used to judge whether low stratus is present (because high clouds are also present). Rapid Refresh model information only is used to outline regions of low-level saturation. There is more variability to the IFR Probability field — that is, it is more pixelated — over southwest Iowa, for example, and over North Dakota. In these regions, low stratus clouds are being observed by satellite and both satellite and model data can be used to estimate regions of significantly reduced ceilings and visibilities. Consider the Brightness Temperature Difference shown below. 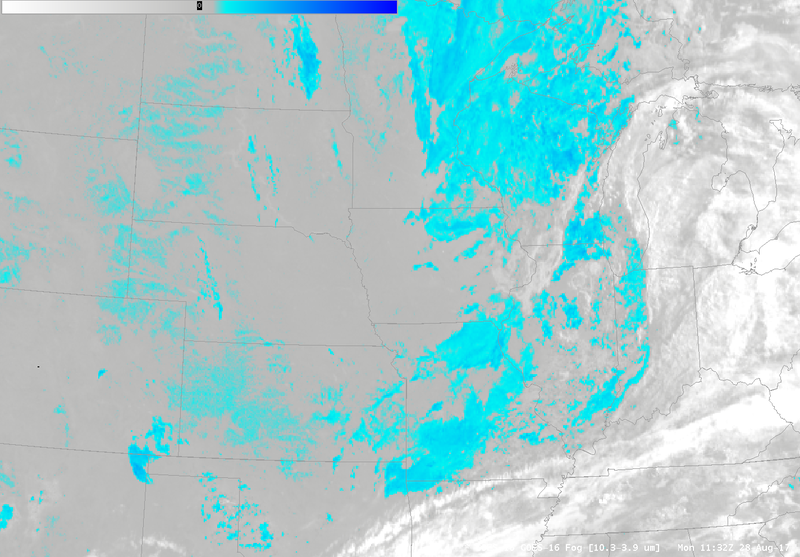 The 10.3 µm – 3.9 µm product is typically used to identify stratus and radiation fog, and it does detect those low clouds over North Dakota, and over Kansas, Missouri and southern Iowa, and over Ontario. 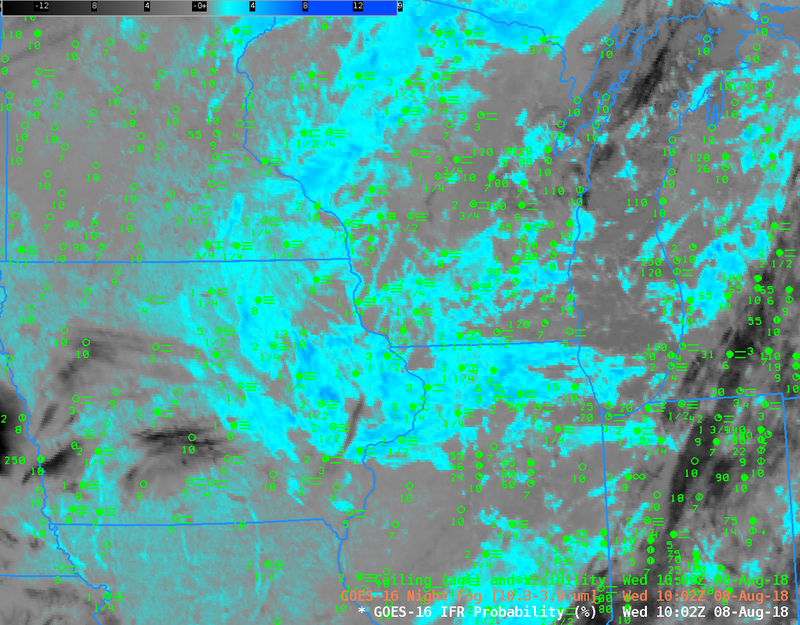 However, the dense clouds associated with the storm over much of Minnesota and Wisconsin meant that this brightness temperature difference field, and also the NightTime Microphysics Red Green Blue Product (which is sometimes used to detect fog), could not ‘see’ the fog over the upper midwest. Know the limitations, strengths and weaknesses of your products as you use them! On 22 January, High Clouds underscored limitations in the Brightness Temperature Difference product, and in the NightTime Microphysics product that relies on the Brightness Tempearature Difference product for fog detection. 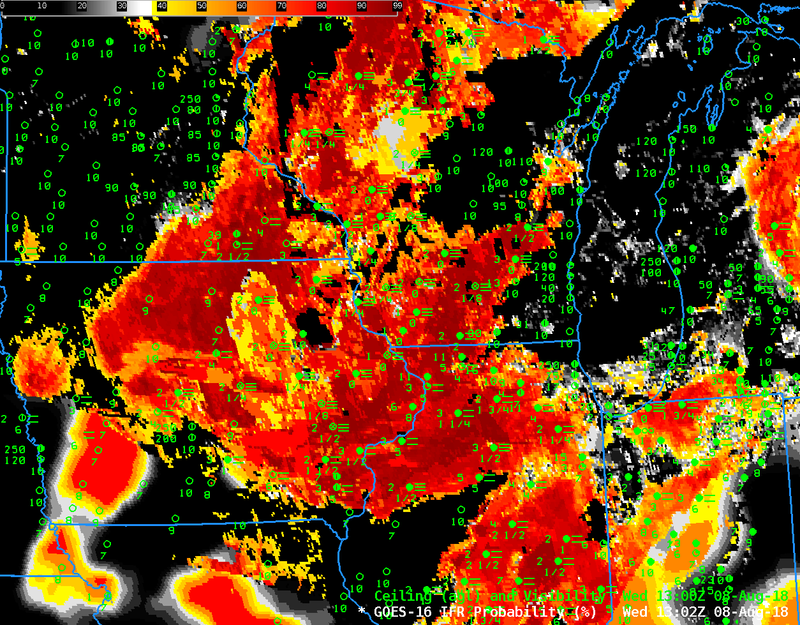 That limitation meant the product was not useful in identifying IFR conditions in parts of the Upper Midwest. This entry was posted in GOES-16, Midwest, Multiple Cloud Layers on January 22, 2018 by Scott Lindstrom. GOES-16 data posted on this page are preliminary, non-operational and are undergoing testing. 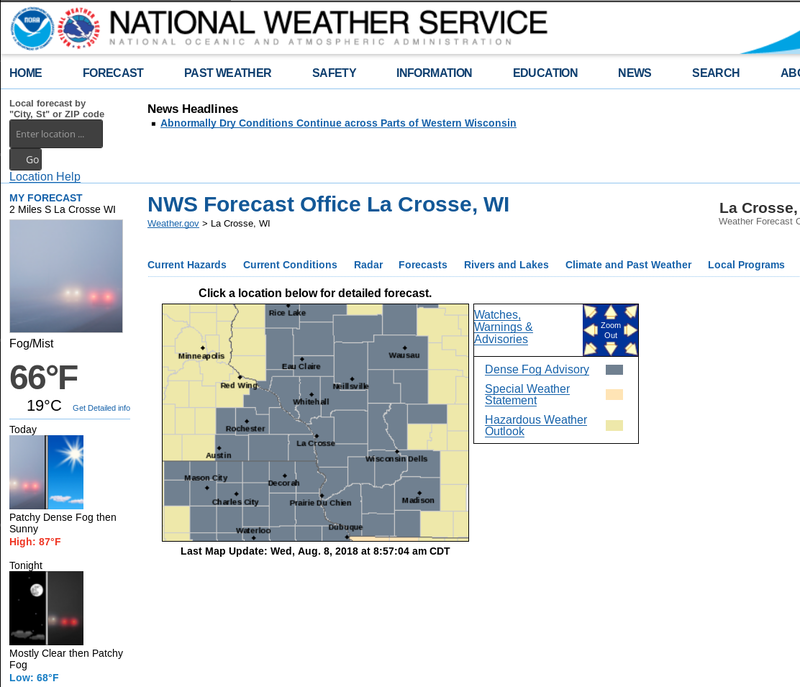 Dense Fog developed over the upper Midwest on Monday morning, 23 October 2017, and Advisories were issued as shown below. 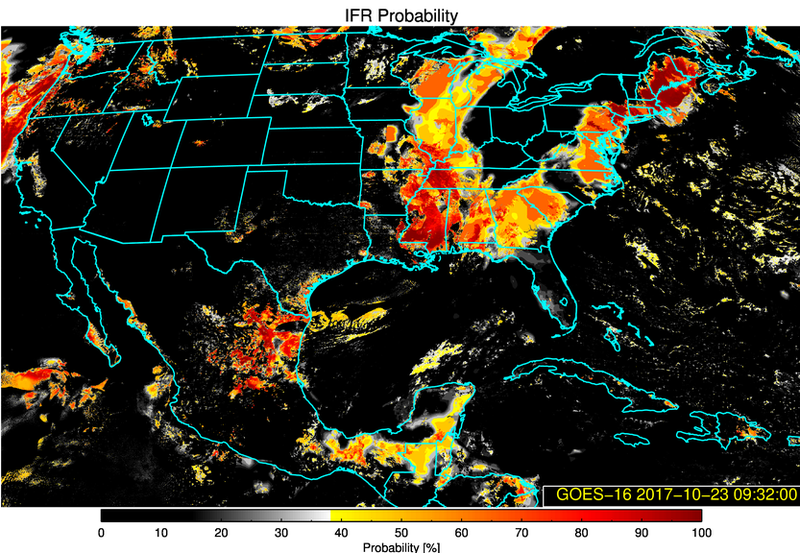 GOES-R IFR Probabilities are now being created using GOES-16 data, those data are now available at this link. 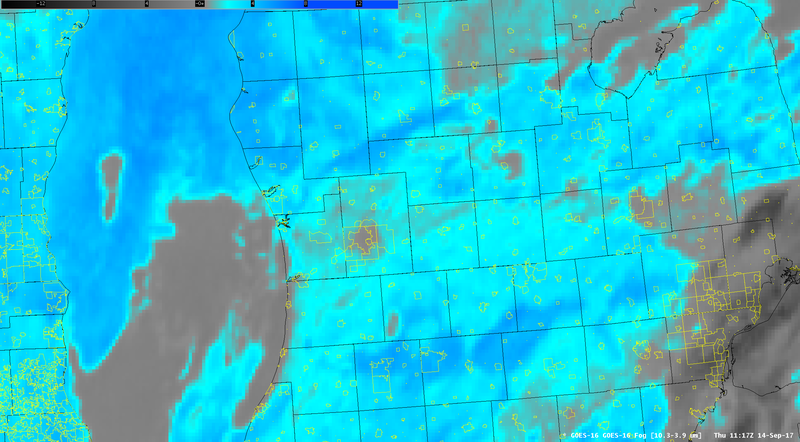 The uniformity of the IFR Probability fields shown above over WI suggest that high-level clouds are present, and the GOES-16 satellite could not therefore view the fog/stratus near the ground: only Rapid Refresh data were used to create GOES-R IFR Probability values. 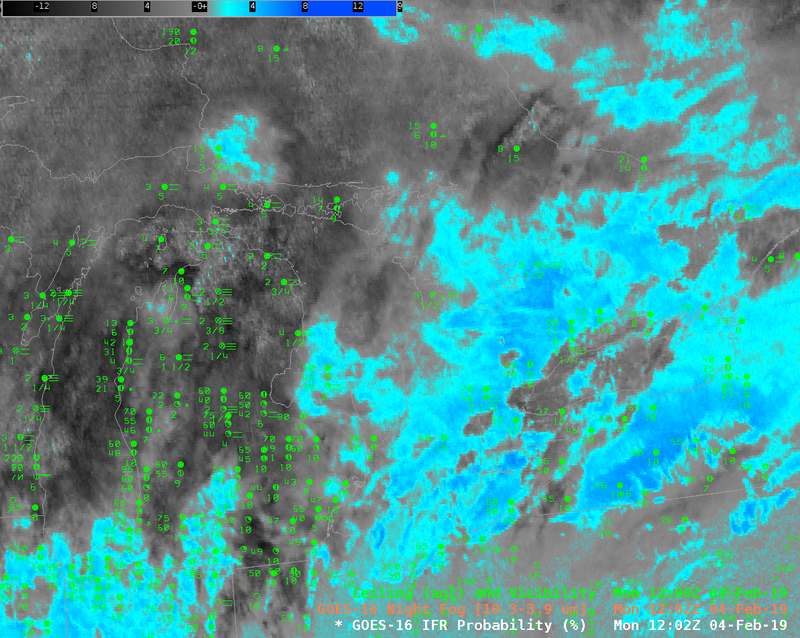 GOES-R IFR Probability fields available to NWS Field Offices via LDM are still being computed with GOES-13 and GOES-15 data. When GOES-16 becomes operational as GOES-East at 75.2º W Longitude, planned for December, IFR Probabilities available through the LDM will be created with GOES-16 and GOES-15 data. The switchover will happen when GOES-16 becomes operational. This entry was posted in GOES-16, Midwest, Wisconsin on October 23, 2017 by Scott Lindstrom. GOES-R IFR Probability fields (From this site, but also available via LDM feed in AWIPS), above, show the development of dense for over Lower Michigan, leading to the issuance of advisories. 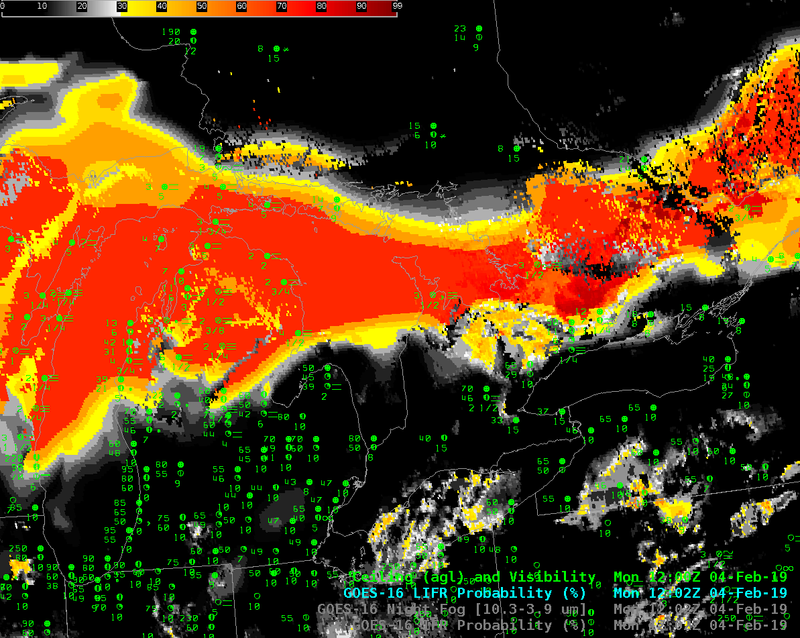 IFR Probabilities on this morning remained fairly low over the relatively warm late Summer waters of Lake Michigan. There is also a noteworthy gap in Fog of unknown origin from Grand Rapids Michigan southwestward to Lake Michigan as fog forms on either side of that line. This is especially evident around 0845 UTC; the gap subsequently fills in as fog becomes more widespread. 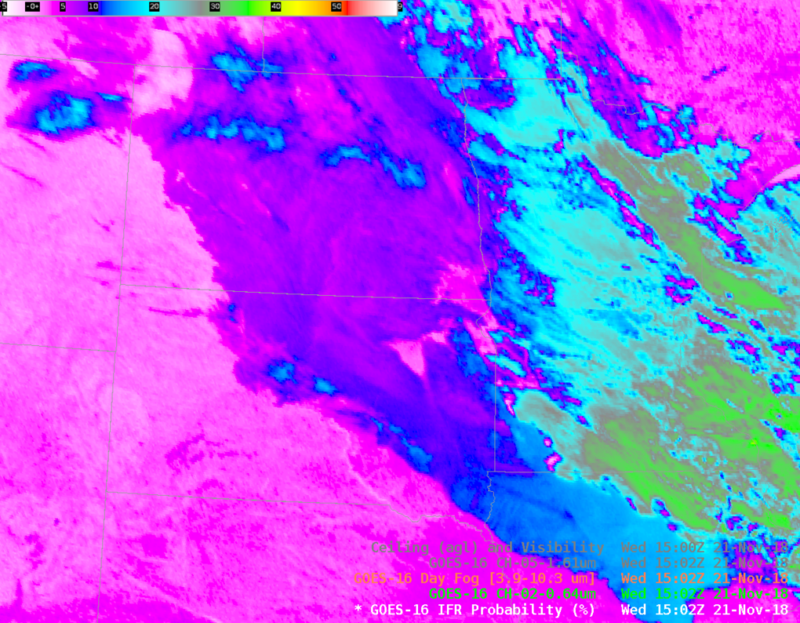 GOES-16 also viewed the fog field, from the top of the cloud deck, as shown below in an animation (courtesy of Nathan Jeruzal the National Weather Service Grand Rapids Office) of the Brightess Temperature Difference field (10.3 µm – 3.9 µm) for two hours before sunrise on 14 September 2017. A still image at 1117 UTC suggests that fog over Grand Rapids’ city limits was not widespread, perhaps due to slight warming in the city due to an Urban Heat Island that would reduce the relative humidity. At the end of the animation, there is a consistent change in signal over eastern Michigan, from cyan indicating low clouds/stratus to grey, indicating no cloud, because of increasing amounts of reflected solar radiation at 3.9 as the Sun rises. 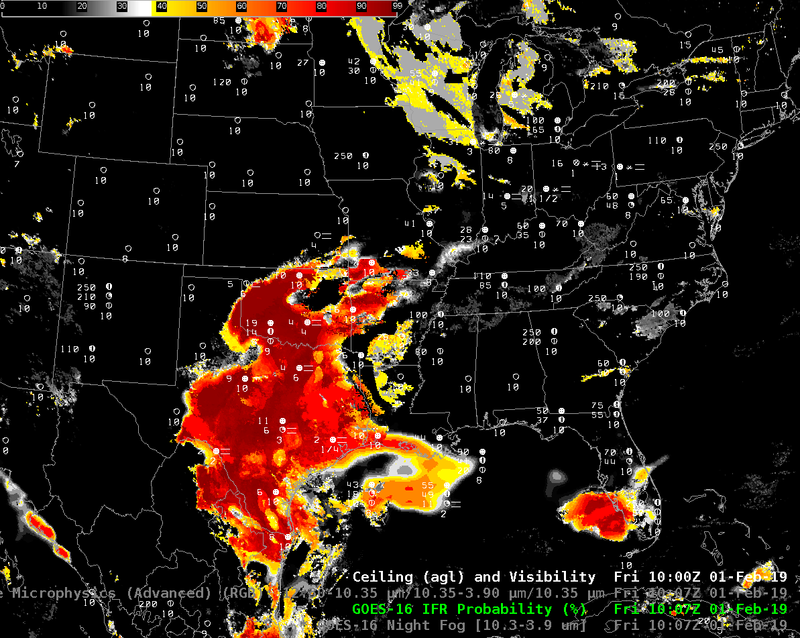 The GOES-R IFR Probability field animation at top suggests that the fog persists through sunrise. This entry was posted in GOES-16, Midwest on September 15, 2017 by Scott Lindstrom. 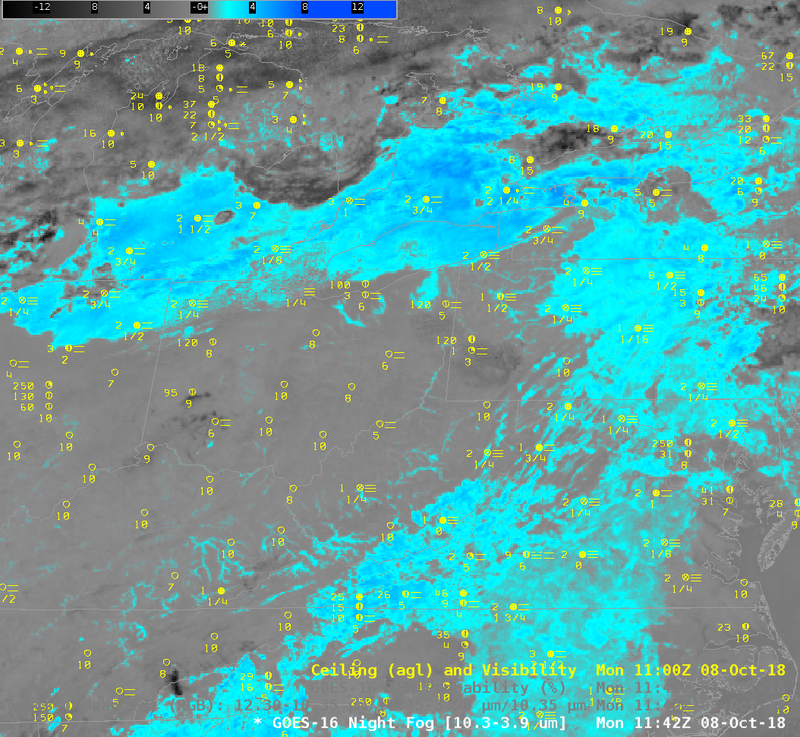 GOES-16 Brightness Temperature Difference fields (10.3 µm – 3.9 µm), above, show the development of stratus clouds (made up of water droplets) over the Plains during the morning of 28 August 2017. The Brightness Temperature for 10.3 µm is warmer than that for 3.9 µm during the night because cloud water droplets do not emit 3.9 µm radiation as a blackbody but those same cloud water droplets do emit 10.3 µm radiation more nearly as a blackbody would. The conversion from sensed radiation to brightness temperature does assume blackbody emissions; thus, the 3.9 µm brightness temperature is cooler where clouds made up of small water droplets exist. 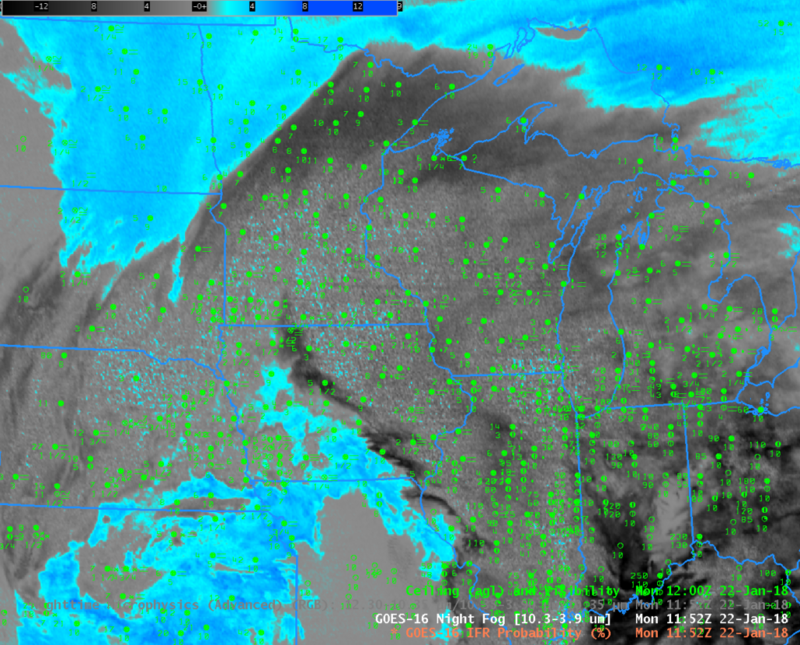 The animation above shows stratus clouds developing over Missouri and adjacent states. Dense Fog Advisories were issued near sunrise for much of the region (see image at bottom of this blog post) and IFR Conditions were widespread. 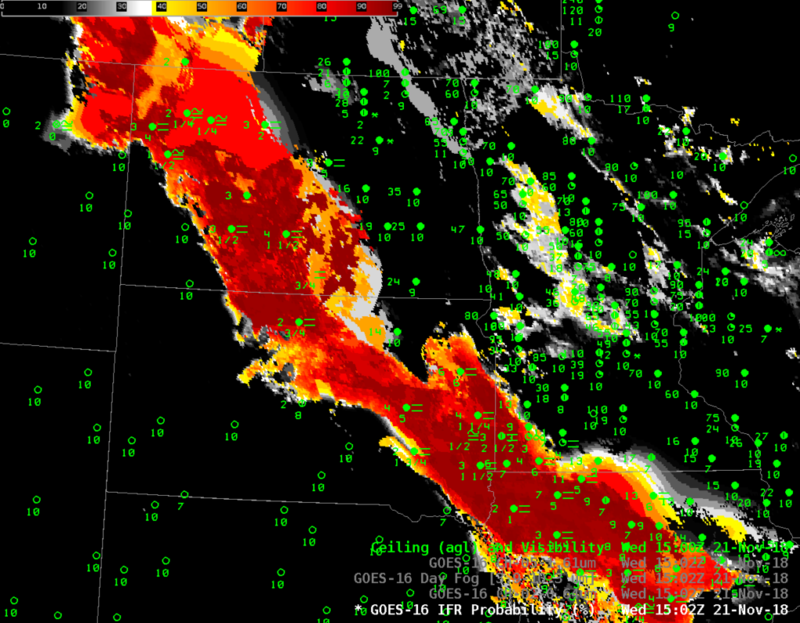 The animation above shows a positive signal over the western High Plains from Kansas northward to North Dakota. 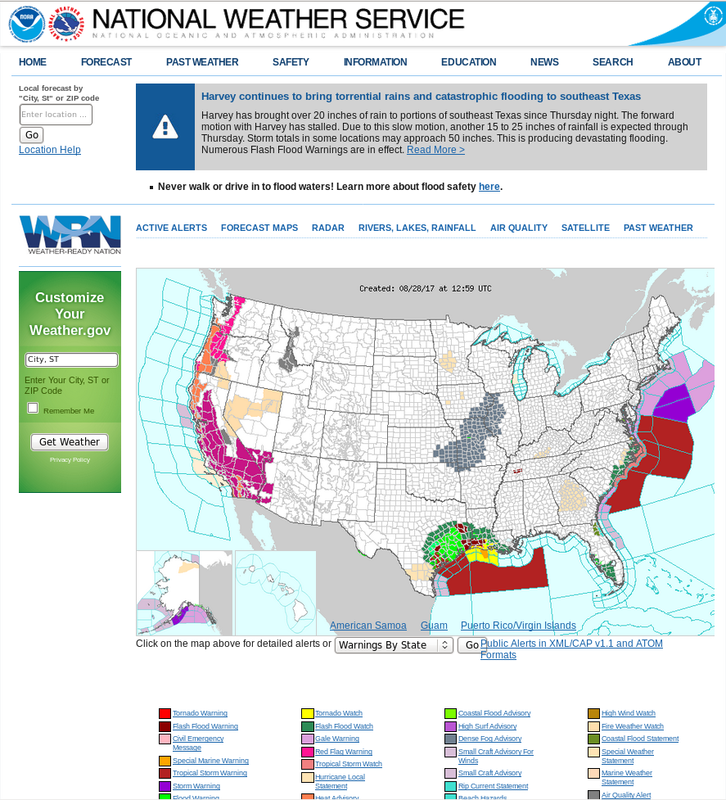 (Click here for the view at 1132 UTC on 28 August). 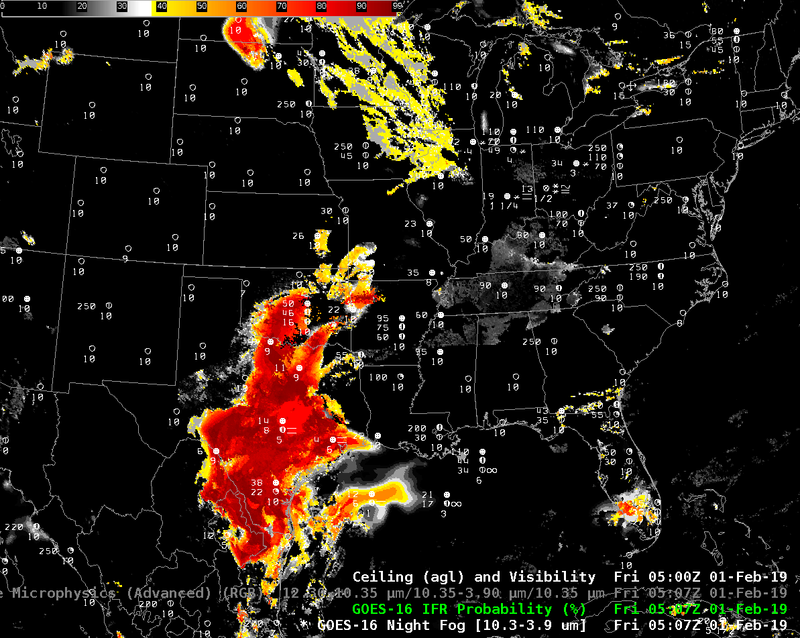 How did GOES-R IFR Probability fields capture this event? 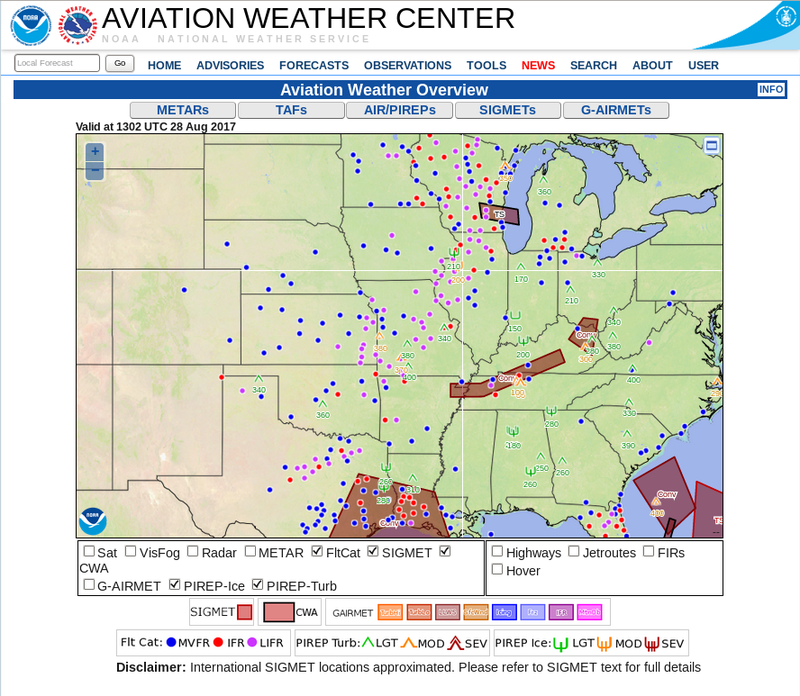 The animation showing the fields every 30 minutes from 0215 through 1345 UTC on 28 August 2017, below, shows the development of High Probabilities in the region where Dense Fog was observed. There is a signal along the western High Plains, but it has low Probability; a conclusion might be that thin stratus has developed but that the Rapid Refresh model does not suggest that widespread low-level saturation is occurring. As the sun rises, the signal over the western High Plains disappears. Click here for a toggle between the GOES-R IFR Probability and the GOES-16 Brightness Temperature Difference field at 1115 UTC. This entry was posted in Midwest, Plains, Uncategorized on August 28, 2017 by Scott Lindstrom.